Hello everyone! We've had a nice little surprise slip through our letterbox this month. It's a little box of sweets from Candy Japan. 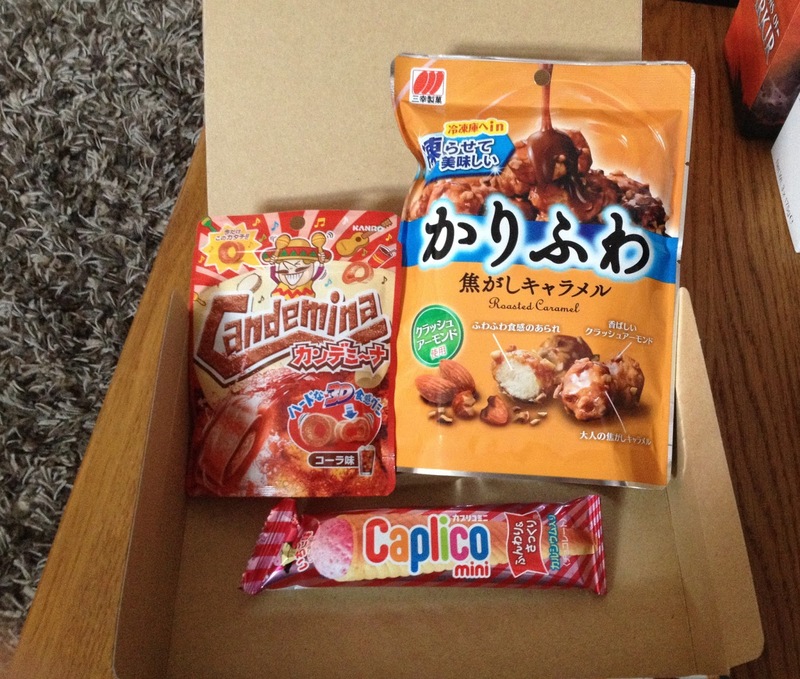 Candy Japan are a small box subscription service that send you two packages a month for $25. 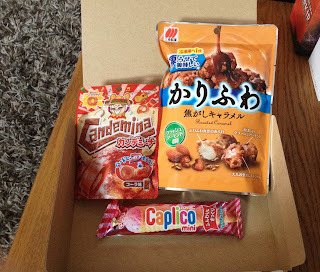 Each package contains a small number of Japanese candy items (usually between two and six items, but occasionally they contain more); it's basically however many they can get into a standard Japanese envelope! Our candy box contained three items; the first was a Caplico mini, the second was a bag with a Japanese name but a description of "roasted Caramel" and the third was a bag of Cademina cola rings. The Caplico mini looks a little like an ice cream cone on the packet, and when you opened it - it was an ice cream cone. It was a little thinner, and obviously didn't have real ice cream in. But it was tasty. The "ice cream" was soft, fluffy and sweet. The first half of the cone had a strawberry flavour, the second half saw that replaced with chocolate. The wafer cone tasted, well, like a wafer cone. It all works well and my only complaint is that it all went away too quickly! These are little caramel nuggets that have a really nice toasted taste to them. They crunch and then there's a texture a little like popcorn (although it doesn't look like popcorn). As you can see in the photo, they're small -- and unfortunately, they're very moreish! I've had to go and tape up the bag and hide it away so I don't gobble them all up in one go! One problem I have, as a non-Japanese speaking person, is that it's hard to understand what's going on with the items; but that's okay, Candy Japan send out an email to explain the contents of the box, and whether there's anything special you need to do. (In past boxes they've had candy that involves adding water, mixing and coating a candy before eating... the sort of thing you might not have been able to deduce without a bit of help). What I did see though, was that these candy's do have some nutritional information on them - although it is all in Japanese - I can pick up the Calories - which is handy as I'm counting them at the moment (for reference: the Caplico mini was 47 Kcal, the Cola rings were 9.5 Kcal (each - I assume) and the Roast Caramel pieces were 313 Kcal for a 60g bag - which I think works out as about 5-6 Kcal per piece). I enjoyed the candies in the box. 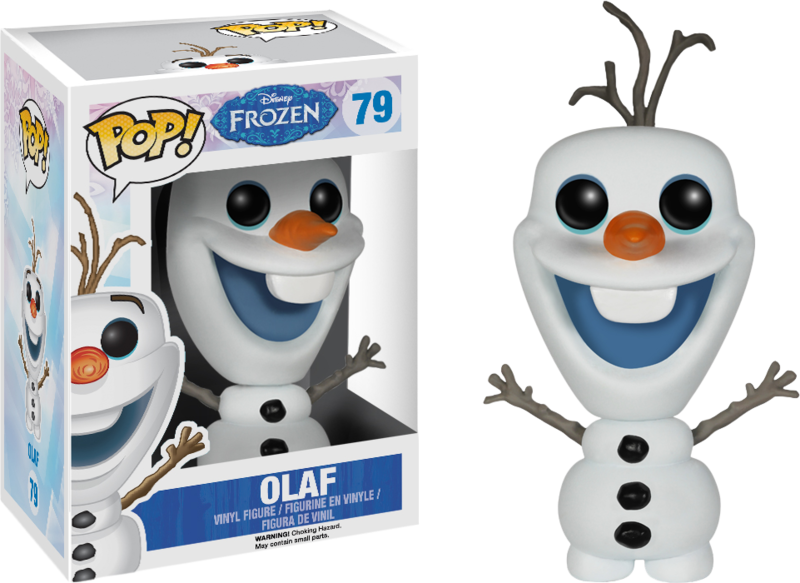 It might seem a lot at $25 (which is about £16), but that is only $12.50 (£8) a box, and postage is included in the price. I think if you like little surprises, and enjoy sweets from Japan, this is a good way to satisfy those urges. If you'd like to sign up for a subscription, or to gift one to a friend, details can be found on the Candy Japan website . Additionally, they have a sizable list of items that have been included in previous boxes, so you can see if any of that tickles your fancy! Five weeks ago I went back to the doctors for my results regarding my gallbladder ultra sound scan and it came back that I had gallstones. I can't say this was the the only reason why I have decided to try and lose some weight. I had put on over a stone in the last year taking me up to a massive 19 stone 8 lbs at the beginning of the year and I just couldn't seem to shift much. So at my appointment with the doctors. I decided to ask for her advice. I didn't really want to go to a slimming club because of a bad experience I had at weight watchers one time. I was losing about 3lbs a week back then and felt I was doing really well and was enjoying going to the weigh ins and even stayed for some of the meetings (with my anxiety problems this was good). I had lost about a stone and a half and the leader just turned on me. I lost 3lbs again that week and she shouted really loudly at me in front of everyone and said that if I lost another 3lbs the next week she would kick me out of the group. I was so embarrassed and upset that I went to my doctors that week who said she was very wrong to do that to me. I never returned to the group after that. It dented my confidence a bit and made me feel bad when really I was doing well. I have a lot to lose. I know how weight loss goes. You lose quite a bit at the start and then it levels off to only losing a certain amount. People continually tell me to go to slimming world and that this was a one off but for me it has put me off and I wanted to make the changes myself. At the doctors I asked for some suggestions on how to lose weight on my own. She told me the best way to do it is by reducing my calorie intake and watching my portion sizes as I already walk about 3 miles a day when walking Shortie. She said I could try eating under 1000 calories a day but I decided that would be too hard so I set my goal of between 1000 and 1500 calories per day. An average woman should eat 2000 calories a day. Also this would help because I would be eating better food and reducing the fat which in turn will help with my gallstones pain until I can have my operation. So Neil went into town and bought me a nice notebook and each day I count my calories and weigh my portions. I was eating probably about eight times the amount of cereal I should be eating each morning and sometimes having the same for lunch! For breakfast now I tend to have porridge and thanks to a recent Degustabox I found some amazing natural sweetener that has a texture like sugar that I put on top called Natvia. I managed to find sachets of them for coffee and tea and I just put one of those on my porridge. Natvia has no calories in so it's fab. For lunch I tend to have a sandwich usually with turkey roll in or something like that and some low fat crisps. The main things I have changed for dinner is if I have pasta I weigh the pasta out so I have the right portion size. Normally I tend to just tip loads in without caring but I was eating far too much. I am eating a lot more vegetables and salad because they are low calorie so sometimes I will have half a bag of salad on my plate. In the evenings I usually have enough calories left to have a hot chocolate from my coffee machine and even a couple of times I have had enough left for a toffee crisp bar. On the weekends I have a little treat. I love having burgers, chips and onion rings just now instead of getting take away we have them at home and instead of beef we have quorn burgers which are really yummy and because I weigh the chips out and know the calories for them it's fine. I usually also have three or four onion rings too. 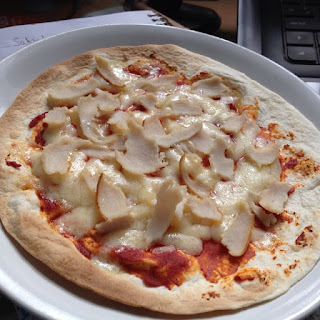 Also Neil decided to have a little experiment in making a pizza using a wrap as the base as a treat and it was yummy. This one has turkey roll on the top and cheddar cheese which has more calories in than when we made other ones with mozzarella instead. We have also altered it to include mushrooms and sweetcorn which has given it a bit more colour. This individual pizza only contains 231 calories where as if I got take away pizza one slice contains about the same! It really is delicious especially as the edges go a little bit crispy too. I am so chuffed and I am really enjoying eating better and feeling less sluggish. I have a long way to go yet but I am determined to do this. I am taking it one stone at a time. My next goal is 17 stone 2.5lbs. I haven't taken an updated picture yet as I don't think there is much difference yet. I am extremely lucky to have my very supportive fiance Neil who helps me out with the calories and keeping me on the straight and narrow. We haven't removed the snacks from the house like the doctor suggested because this isn't a diet for Neil who isn't over weight but I just know that if I cheat then I am cheating myself and no one else. There will be times when I will go over the 1500 calories like if I go for a meal with my family but for the most part I am sticking to this. This isn't a diet.....this is a lifestyle change....and I am loving it! 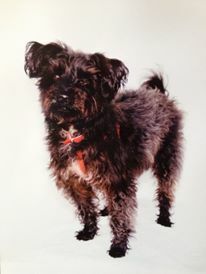 I'm sure my regular readers will know that this is my boy - Shortie - he is a twelve year old Yorkie Poodle. I rescued him three and a half years ago from Bath Cats and Dogs Home. First up we have Jessie who is a three years old Jack Russell. She absolutely loves Neil and chasing the ball in the park. 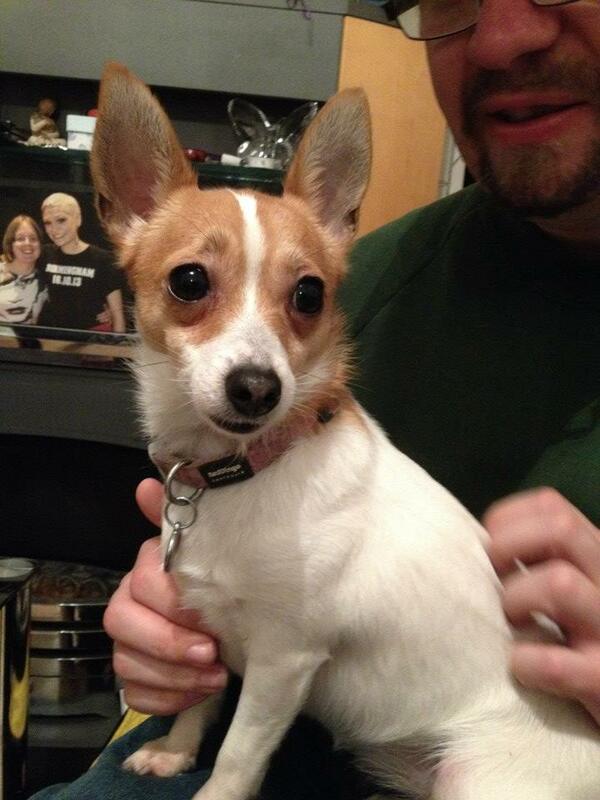 Next up is Tilly who is nearly two years old. She is a Jack Russell x Chihuahua - though really we think she is ninty percent Chihuahua. She is a real diva and whilst she is the smallest of the pack she is very much in charge. 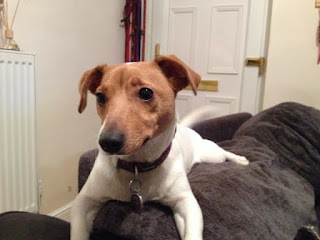 Then there is Toby who is a one year old mini Jack Russell. He has the same mum as Tilly but a different dad. 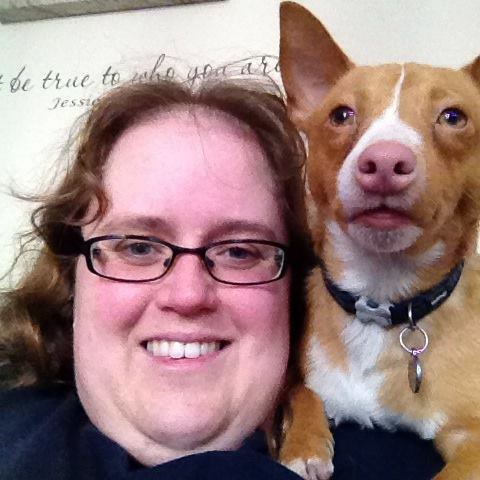 He is funny with his pink nose and almost human like eyes. 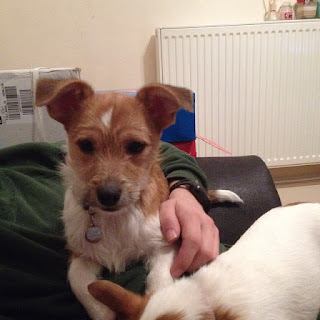 Then we have the pups who are now about 7 months old. 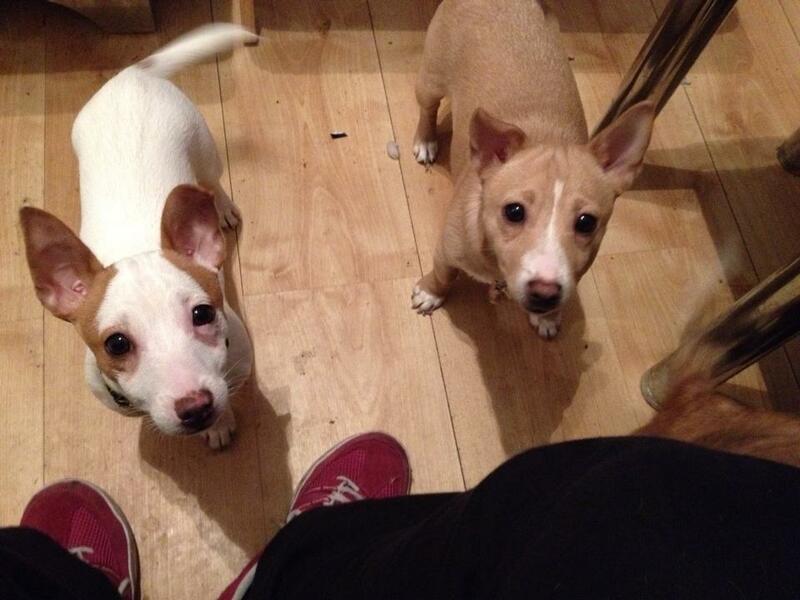 Jack (the white one) and Bella (the sandy one) who are also mini Jack Russell's - brother and sister from the same litter and have the same mum as Toby and Tilly. I love these two so much especially Jack Jack. It's hard to explain but I just love him so much. And then we have the puppy Gizmo who is just a complete and utter nutter. 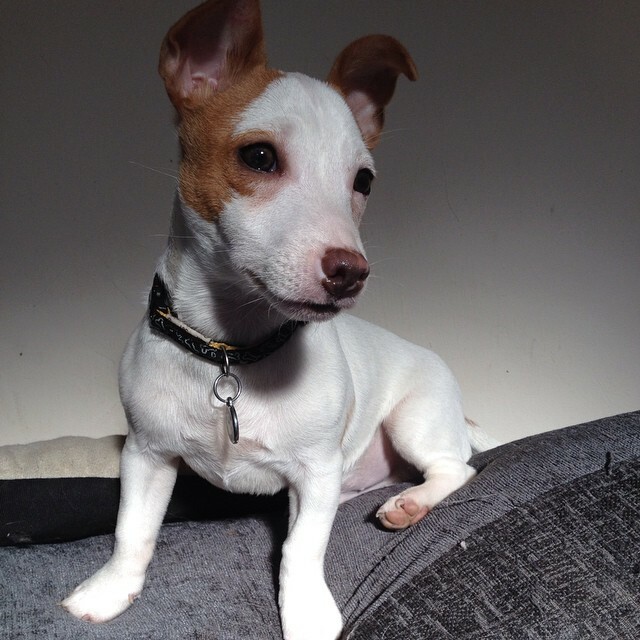 He is about 6 months old and is supposed to be a Jack Russell x Chihuahua but we are not so sure what he is because if you compare him to Tilly he is completely different. He just has a puppy brain and is in to everything. So we decided to take all seven of the dogs to the dog show. What a nightmare!! Gizmo was very yappy from the start so Debs decided to take him back home whilst Neil held the other dogs and I was in and out of the ring with various combinations of dogs depending on the category. Debs returned just as I was coming out the ring with Jack who had won second most handsome dog. When the judge came around Jack gave him his famous smile. He gets so excited when he sees people he goes all smiley. Everyone at the park loves it. I didn't get a picture of Jack with his rosette and certificate but I took this amazing photo of him awhile back which I love. I took Shortie in a couple of categories. Some I regret taking him in like the "best six legs" when people wore leg warmers and put them on their dogs. I just went in as I was. 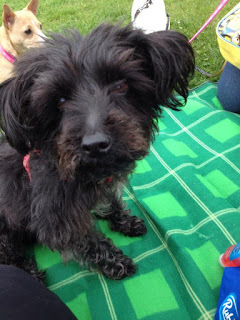 And also "best rescue dog" which because Shortie's back story isn't too bad we had no chance but saying that by entering the categories I was giving to charity to help other dogs. Shortie did have some success though. He came second in Scruffiest Dog and third in Best Cross Breed. I was so proud of him as he really behaved himself. 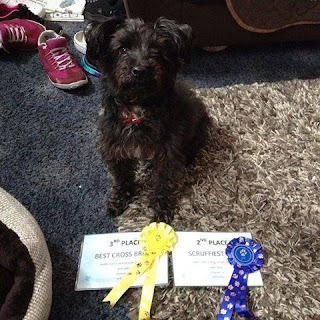 He got certificates, rosettes and goody bags with treats and a ball in. We had a good look around the stalls there too and there was a professional photographer there as well who took this lovely photo of Shortie that I have bought. The only bad thing about the day was that the weather wasn't great but at least it didn't rain too much and that Debs battery in the car went flat and we had to walk back home with the six dogs. We had a great day out though and I hope that Happy Staffie Rescue made lots of money for their charity. We look forward to the next one though we might take less dogs! The Fuel 10K Protibrick tastes just like Weetabix; they're a similar size and shape... although they do make the point that "they don't cut corners," so, unlike Weetabix they have square corners rather than the curved ones of the similar wheat-cereal-brick-thing. To be honest, it does raise the question: "Why get these instead of another brick-brand cereal?" The answer (because I have the answer) is that these wheat bricks have extra protein in them. The idea is that the extra protein helps those early risers feel full for longer. In fact, the back of the box has a motivational paragraph from Steve Parry, Olympic medallist, talking about this and about himself. So I'm not a Weetabix fan, but that's okay, Neil is - so I've been feeding him (actually, he usually feeds himself... ) these bricks for breakfast and he liked them. He's not sure if he noticed any benefit from the extra protein, although he often found he wouldn't snack as much in the morning as he did with his regular breakfast. All in all, I have to say if you like wheat-based brick cereals, and need extra protein in your diet (for whatever reason), then these are a reasonable way to get it. (As a note, they give 6.3g of protein per 2-brick serving - I keep meaning to check in the supermarket how that compares to other cereals). They taste as good as they look. Each bite has such a medley of flavours that just go and taste so good together. Calorie-wise, we're talking 213 Kcal per bar; but that's 213 Kcal of nutritious seeds and fruit and amino acids - so loaded with all that good stuff. We would definitely recommend these; so much flavour and great taste, and full of things that good for you making it a nice thing to reach for when you need a mid-morning snack. From a healthy snack that you don't feel bad about having to one that you can't help but feel a little like you're being indulgent and a little naughty about eating. These authenic Dutch Stroopwafels (I'm just copying the writing on the packaging here, I have no idea what a stroopwafel is or how you'd tell an authentic one from a counterfeit one...) are delicious! What we are looking at is a thin, wafer-like biscuit with a caramel middle. While you can eat them straight from the box, it is nice to pretend you're in a coffee shop and place the stroopwafel on top of your hot drink and let it sit there a few minutes and warm up. Warm, these are divine and to die for. Cold, they're alright... but they're much nicer warmed. Definitely would recommend these - they are a lovely luxurious addition to your elevenses time cuppa. Neil loves it when we get a box with anything ginger in it. He is a huge ginger fan and if I'm not quick will scoff anything ginger we find in the box before I have chance to take photos! So this month's box, with a bottle of Fentiman's ginger beer, really made his day. He said, because I didn't get a chance to have even a swig, that it tasted nice. That you had a nice, clean taste that goes from subtle and mild into something with a distinctive, fiery aftertaste. He said it had a different feel to other ginger beers, but that wasn't a bad thing. He would buy/ drink it again and looks forward to seeing what's in any future Degustaboxes we receive. Just as a note, this item wasn't in all Degustaboxes; in some this was replaced with a Green Coco juice drink. Although I am a fan of coconut and certain coconut flavoured beverages, my experience of coconut water has been... well, it's been a bit of a disappointment; so when I saw that there was some coconut water based drink in the box I approached it with trepidation, expecting a disappointment. I couldn't have been more wrong though, and the coconut juice in this drink is quite subtle and takes a back-seat to the star flavour, which is banana. These cartons are part of Dr. Antonio Martins' (not to be confused with a similar-named boot-maker) kid's range of organic drinks. These Coco juice with banana are aimed at the younger child. They have low acidity, low calories (checking on the website shows 36 Kcal per carton) and are full of flavour. Although they're aimed at younger children, these have such a nice taste, I can't see a reason why older children and adults shouldn't enjoy them. I know I did! He had to say that it was nice. That it had a good "balsamic" flavour with a pleasant hint of a classic Sarson's malt vinegar aftertaste. That it tasted really nice on salad leaves, with or without an oil compliment and he enjoyed it a lot. Staying with the condiment theme, we have some BBQ sauce - "straight off the boat from the USA," the accompanying Degustabox note says. It says it's good for marinating and cooking, as well as being used for dipping (or covering your food in). We've only used it as a dipping sauce so far, but were impressed with the flavour. I know with past Degustaboxes we've been treated with all sorts of different BBQ sauces - and to be honest, there isn't much we can say. They are always packed with flavour and a bit posher than the regular brands (we all know and love) - and Sweet Baby Ray's BBQ sauce is no exception, with the right blend of sweet and smokey flavours - it is mouth wateringly delicious! There is a flyer with a couple of recipes on (pulled pork and bacon cheeseburger flatbread) using the sauce which look and sound divine! We might give a couple of them a go in the near future (unless we run out of sauce). In case we put on too many pounds with the BBQ theme, there's some slim pasta to help us lose weight. What this is, is some lasagne sheets made from konjac flour and oat fibre. It is a low calorie alternative to regular pasta and is free of … well... almost everything people might want it to be free of (Gluten Free, Fat Free, Sugar Free and Wheat Free) while being high fibre. As it isn't something you can just have by itself (although it does suggest blending the pasta with water/ juice to make a smoothie, although it's not something we tried (or can imagine doing!)) 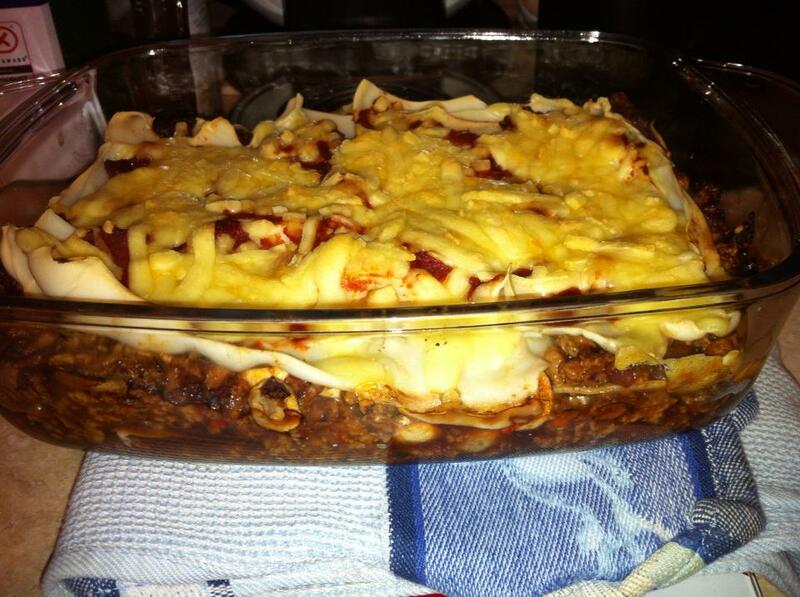 we made a lasagne with it and some quorn mince. We were warned that there might be a bit of a fishy smell to the pasta, but it would be fine after rinsing under water a few times; plus, once cooked it would be fine. 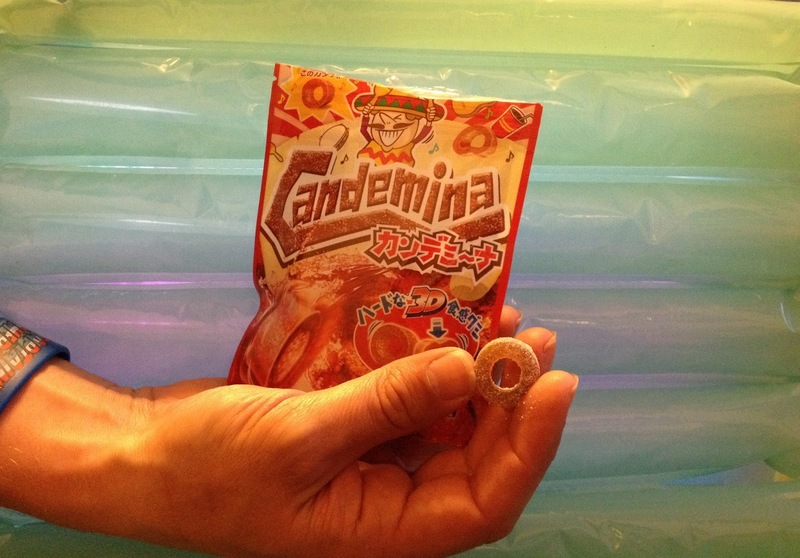 We found that on opening the packet, the smell was there - but washing helped a lot. So we cooked up the lasagne. It looked pretty good, and tasted good. It made about 4 portions and was delicious! The only difference we found was that where the pasta hadn't gotten enough sauce, it was a little rubbery (whereas regular pasta tends to just go a bit … hard). Not bad at all though, and for the low calories and the free-from-everything-ness of it all, it had a really good flavour and did exactly what it said it would on the packet. At time of writing we haven't been able to use this yet, but we really like the sound of it and will have to write an update to say what we think of it later. What it is, is a marinade in a bag. We were sent the Honey and Soy flavour, although there are 6 different flavours available, each being a different taste sensation from all over the world. The way it works is that you have your meat (chicken, pork, beef, etc. ), fish or vegetables and place in the bag; you then leave for 15 minutes or overnight in the fridge and, when you're ready, cook it! It's that simple. Which we've also been sent this month (but haven't had chance to use yet). We were sent two bags of Maggi So Stir Fry Noodles; one being the Singapore Curry Chicken Noodles, the other being the Oriental 3 Spice Chicken Noodles. The way these work is that you add a number of chicken breasts (4), an onion and peppers (for the 3 Spice) or chicken breasts, carrots, a red pepper and a leak (for the curry). The packs contain enough noodles (and seasoning) for 4 portions, and look relatively easy to prepare - and fairly quick. (Around 25 minutes from start to finish according to the packet). We really like the idea of these too, and are looking forward to using them in the near future. Well, that's another month of food delights. We are always impressed with the range and selection on offer from the Degustabox box, and always find a mix of things we either wouldn't usually consider trying along with things we already know and love; and, since we've been receiving the Degustaboxes we've found ourselves seeking out some of the products we've been exposed to and turning a one-off taste test into a regular thing. Hey everyone. I just wanted to apologise for the lack of posts on here of late. For the past few months I have been suffering from fatigue and gallstones. Put them both together and I have been feeling rough. Earlier this year I visited a specialist at the hospital and I was finally diagnosed with Chronic Fatigue after 18+ years of not really knowing why I am tired all the time. I had wondered for a long time if this was the case but as no doctor had given me a formal diagnosis I just wasn't sure. After lots of blood tests over the years they finally concluded that it must be Chronic Fatigue. There is no real test for it and I've had it since I had glandular fever in my late teens. Some days I sleep for 20 out of 24 hours. I am now waiting to go to the hospital for a group session and then to get more help in controlling the illness as I really do hope to feel well enough and reliable enough to return to work one day. In the past year I have been suffering from stomach pains too. My doctor diagnosed me with a hiatus hernia and I was given tablets. In the last couple of months though the pain has got worse and the tablets haven't been working so I went back to the doctors and she sent me to the hospital for an ultra sound scan. It was confirmed that I have multiple gall stones so I am going to have to go into hospital for an operation to remove the gall bladder. In the mean time I have to keep to a low fat diet which I'm doing well on and slowly losing weight too. I am quite nervous to have the operation because I have never had an operation before and I hate the fact that I might have to stay in hospital over night. I am hoping it will be an in and out in one day job. It's keyhole surgery (unless they have troubles getting it out that way). I am also hoping they can do it at Kidderminster hospital as Neil and I don't drive and it will be a nightmare getting too and from Worcester. Is it sad that I actually want to ask if I can keep the stones? I want to see what has been giving me so much grief over the last year. I have no idea how long it will take to get an operation date but I am hoping it will be soon. Anyway, more posts coming up soon.